What are we to make of the multiple requests to rename parts of Jos. 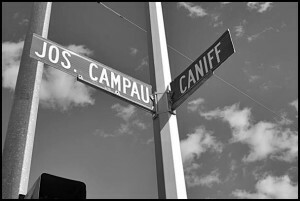 Campau and Caniff in honor of two deceased Bangladesh state officials? Frankly, both people being proposed were despots who were killed in military coups. Neither of them deserves more than a footnote in history. They hardly represent the spirit of democracy this country was founded on. We agree with Mayor Karen Majewski’s assessment that these political groups are “using” the city to best one another. To us, it’s childish and disgraceful. Certainly the Bangladeshi community has contributed a lot to the city and revitalized it, and that’s why Conant was given the honorific name Bangladesh Ave.
Hamtramck has plenty of needs right now, but coming up with people to honor on our streets isn’t one of them. There are currently four parts of streets bearing a ceremonial name, and there’s a reason why there are so few. If we went about renaming all 53 streets we would have a clutter of signs that would confuse drivers and delivery people. Renaming a street should be a rare thing as a measure of importance of the honor. It shouldn’t be something that is handed out here and there on whims of local political groups who have a bigger interest in scoring points against one another. Let’s keep the feuding political parties off of our streets. No one should be interested in remaming our streets after foreign political figures!!! They haven’t contributed to our country or community! Put your time & energy into doing something for the city & country in which you live!! Teach your children pride & respect for our great nation & Hamtramck!! Bangali council member has nothing else better to think about so they are causing problem among each other by thinking childish issue like this. They shouldn’t be our leader.